Have you been searching for a way to Bible journal and study the Word for free? Move the Mountains has several free Bible journaling videos that can help you do just that! Currently, we have three other options available for you depending on how much time you have to commit. Each of these free Bible journaling videos is geared for beginners to Bible journaling and have an art tutorial alongside a study or devotional. These 3 Bible journaling video series are delivered via email. Also, many have free downloads to help you along in your study. Please choose from our three options below. They all have simple Bible journaling ideas to help you learn how to do Bible journaling. Thousands of women have participated in them and fallen more in love with God’s Word. Time in the Scripture is never wasted, get started today! 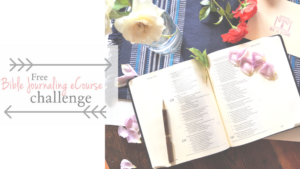 The Free Bible Journaling eCourse Challenge is a guide that was designed for the first month of the year, 31 days of January. However, it can be completed any time of the year! 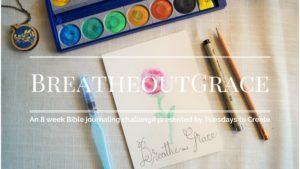 If you are ready to jump into Bible journaling every day (even if you have never done it) for the next 31 days, this is the right guide for you! This free Bible journaling guide is delivered once a week for 8 weeks. It is a practical study in how to speak graciously from the heart. This study has had great reviews by those who have completed it. For example, it has helped me in my own personal life with the way I speak to my family! 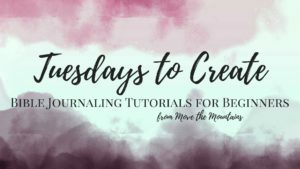 Tuesdays to Create is a free Bible journaling video tutorial series specifically geared for those new to Bible journaling or those who don’t feel artistic. TTC is currently under construction but you are welcome to sign up and wait for it to be completed!